Generate electricity directly from heat. Bring the 2nd Law of Thermodynamics to life using this device that can act as a heat engine, a refrigerator or a thermoelectric module. 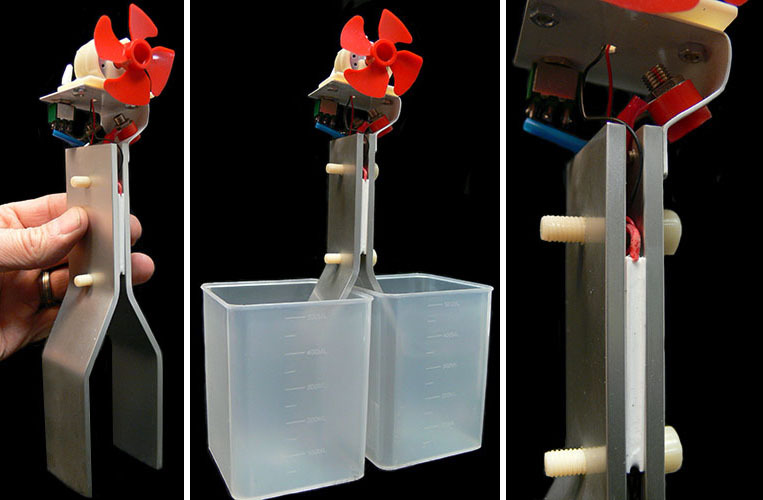 Immerse the two aluminum legs in baths of different temperatures (or just cool one and heat the other), and produce enough electrical energy to power the small wind turbine! Plug into the banana jacks and measure the voltage output with a multimeter. The unit comes complete as shown - with two containers for hot & cold water, thermoelectric demonstrator, and manual with teacher's guide - ideal for classroom demonstration or experimentation. Use as-is or dismantle and use the components to build your own thermoelectric device. Sandwiched between the aluminum legs is a Peltier Thermoelectric Chip - but instead of being optimized to produce heat & cold when electric current is applied (like our Peltier Thermoelectric Cooling Chip), this Peltier device is the reverse - optimized to produce electrical current when there is a temperature differential - when one side of the chip is cold and the other hot. Similar devices are used in nuclear powered deep space probes. In these applications, a nuclear isotope is chosen that will produce heat for many years and one side of the thermoelectric chips are attached to it, while the other side is cooled by heatsinks. The possible applications for these unique devices are endless. Maximum output voltage is approximately 1.2 volts.